In this week’s economic update we take a look at the latest employment figures released from the Eurozone and what possible impact this could have on Europe as a whole. Following this, we steer towards Brazil to discuss the policy reforms proposed by the newly elected President, Bolsonaro, deemed the tropical Trump. It isn’t hard to conjure up a list of media headlines, all negative, and associated with Europe. We will not repeat them all and offer just a sample – Germany’s slowdown in export growth, France’s ‘gilets jaunes’ or yellow jacket riots, Italy’s budgeting quarrel and the ever-present uncertainty surrounding Brexit. Despite this seemingly fractious and gloomy backdrop, new employment data released earlier this week from Eurostat paints a different picture based on a positive factual trend. High Eurozone unemployment which many say is one of the main reasons for the rise in so called populism, has fallen below 8% for the first time in over a decade. The revised figure is 7.9% and beats many economists’ expectations. It is now back at levels seen in 2007 just before the global financial crisis struck a near fatal blow. Eurozone member composition is different from the European union. It is comprised of those EU members who adopt the Euro as their legal tender, currently 19 of the 28 countries. This is a large slice of the total union with a combined population of 341.5 million people of the European Union’s 511.5 million total. The countries contributing most, both economically and demographically are Spain, France, Germany and Italy boasting 74.7% of the Euro-zones population and 75.6% of its nominal GDP collectively. Much attention has been focused on political and global trade concerns, but the Eurozone economy is clearly in better health than many would have us believe. Germany and the Netherlands have achieved very low unemployment rates, of 3.2% and 3.5% respectively, and now the weaker economies are seeing improvements across their labour markets. Italy, Greece and Spain have all had a noteworthy year on year reductions in their jobless rates as is seen below. Europe is very sensitive to global economic trade based around a large export component driving its economy; for Germany in particular, but arguably for the whole of the EU. The current cooling of fast US-led global growth is leading economists to reflect on the trade outlook for the Eurozone. In addition, businesses have been rattled by the fallout from the 2018 US-China trade wars, but recent discussions between President Trump and President Xi of China may yet lead to a positive outcome, which will come as a relief for everyone watching the drama unfold around trade. In this context it may be possible for Europe to continue to create jobs and deliver a positive outcome for 2019. Last weekend electorates lined the streets to welcome gun firing, horseback riding, former army general Jair ‘Messias’ Bolsonaro as he waved from the back of a Rolls Royce on the eve of his inauguration as the President of Brazil. Like Trump he has made controversial and upsetting comments, raising concerns about his leadership style and what this means for the future of Brazil: the eighth largest economy in the world. Bolsonaro’s style has earned him the nickname ‘The Tropical Trump’. So why the warm welcome? Once one of the fastest growing economies in the world, in 2014 Brazil fell into the worst recessions on record. This happened under a former left-wing government. Brazil’s problems at that time were fuelled by a lack of budget control, corruption scandals, involving many nationalised institutions, an inefficient corporate sector and a deterioration in commodity prices. Although witnessing an end to recession in 2016 the economy has struggled to bounce back, due to large amounts of government debt and high unemployment levels despite the country’s interest rates being at historic low levels (averaging 10.4% over the last decade) as demonstrated in the table below. Bolsonaro plans to make several changes to restore the national motto of ‘order and progress’, and there is a particular focus on pensions. Pension reform is essential, but controversial amongst voters. Soft rules relative to the developed world mean state pension distributions account for more than one third of total tax revenues. This is unsustainable given an ageing population. The current system is also considered to be unfair because 53% of the pension distributions go to the wealthiest 20% of the nation and just 2.5% going to the poorest 20%. 1. Increasing the retirement age. Increasing it gradually to 62 for men and 57 for women saving the present equivalent of 5.5bn US dollars per annum: The current system allows Brazilian workers to retire in their mid-50s. 2. Enhancing the private pension sector to reduce the burden on the state and improve retirement planning and facilities. Aside from pensions the government is also making changes to its executive team. It will now primarily include free market thinkers, shifting the emphasis away from big government toward privatising state-owned enterprises. As many as 100 state-owned subsidiaries will be sold into private hands. Bolsonaro believes that under new leadership they will be run more efficiently removing government from the fibres of business. He also hopes it will reduce corruption and lower government debt levels, music to the ears of capital market participants who have watched the country go from ‘superstar’ to ‘falling star’ status. A recent survey carried out 3 months after the October election shows business confidence at its highest level in 20 years. Participants believe economic conditions will continue to improve in the coming months. Another way to judge the shift in sentiment is through the eyes of investors. 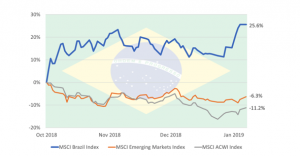 The Brazilian stock market has responded extremely positively to an upbeat vibe. 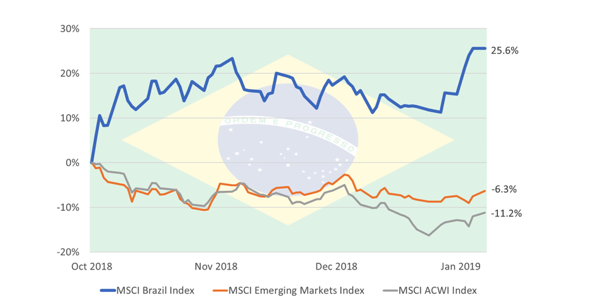 Not only has it powered ahead, Brazilian equities have increased by 25.6% since October, it has done so at a time when emerging and developed market equities have all fallen sharply. Bolsonaro has surrounded himself with like-minded individuals, many of whom are ex-military. To keep momentum going he must act quickly. This requires pushing through his policy reforms which will not be easy in a congress where he lacks an overall majority. It will be very interesting to keep tabs on the “Bullsonaro wave”, as many are calling it, to see if it can keep going or like most forms of populism loose energy as reality bites.